Taxicab fares neatly exemplify economic condition in Egypt during the mid-1980s. For many years the price of a taxi ride was fixed by the government at five cents for the initial half kilometer, with each additional kilometer costing ten cents. This price was realistic back in 1971, when I first lived in Cairo, and for some time thereafter. Money was scarce, and a penny was still worth something. By the end of the decade, however, after oil-induced inflation hit the city and disposable income rose dramatically due to remittances by workers in the oil fields and the open door policy, more people began taking the same number of cabs, and it became increasingly difficult to find a ride. Year after year, the real price continued to drop and demand continued to grow. Then something happened that would please free-marketers. Within a period of several days, all the cab drivers abandoned their meters and began to charge what the market would bear - roughly four times the old prices. Today the meters sometimes tick away, sometimes not - in either case they have no bearing on the fare, which is established by convention or, failing that, haggled over by driver and passenger. Taxi fares mix archaic price controls with a wildly unregulated free market. They codify disrespect for the law and turn daily transactions into complex affairs to be negotiated. In a small way, taxi fares signal the economic problems of two eras: socialism under Gamal Abdel Nasser and capitalism under Anwar as-Sadat. In the view of many Egyptians, they have inherited the worst of both economic systems. 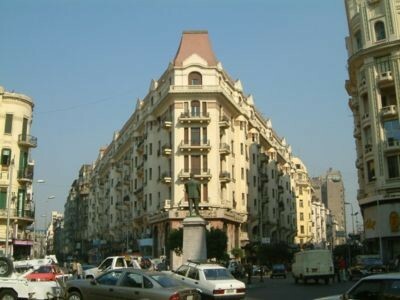 A view of the European section of Cairo. The wretched condition of apartment houses and office buildings in Cairo serves as another graphic illustration of the problems caused by the uneasy marriage of socialism and capitalism. Rental prices fixed during the 1950s have remained virtually unchanged ever since. A tenant who has been there from the beginning of rent control might pay $14 a month for an elegant eight-room apartment in the most expensive part of town. The tenant enjoys a legal right to continued right of occupancy and is even permitted to sublease. With the influx of foreign businesses in search of petro-dollars, the original tenants commonly get $2,800 a month-or two hundred times as much as they pay in-and they pocket the difference. Because this immense profit goes to the renter rather than to the owner, the owner has neither the incentive nor the means properly to maintain the building. Unpainted exteriors, decrepit interiors, chipped stairs, broken elevators, and unlit hallways are the norm. Within, you never know what you'll find. Some apartments are wonderfully maintained and elegantly furnished; others have charred black walls, broken windows, and pitted floors. All too frequently, buildings are allowed to deteriorate and sometimes they collapse. Cairo is a city in the process of decay. Taxi fares and subleasing are just two of the exotic conditions resulting from Egypt's contorted economy. Other symptoms include the consumer subsidies which now devour one-third of the government budget - but which no politician who remembers the 1977 bread riots dares to touch; the absence of internally generated capital; and a staggeringly high birth rate. About a million more people crowd each year into Egypt's tiny arable land and gobble up prime agricultural lands for housing and roads. During a recent visit, several Egyptians emphasized that economics is but one dimension of their country's failures. They pointed out that social justice, military success, and political stability also remain beyond Egypt's grasp. Disillusioned with the efforts of both the Abdel Nasser and Sadat regimes, many of them seek other approaches. Some look to Islam for solutions; others, surprisingly, look back to the period of the monarchy before 1952 with a new interest and unprecedented nostalgia. To the visitor, however, these concerns appear less immediate than the other great topic of discussion in the capital city: infrastructure. When the British laid out the modern city of Cairo at the beginning of this century, they envisaged an eventual population of under a million people. Judging from recent aerial photographs, demographers estimate the current population at somewhere between 12 and 15 million - and it continues to grow rapidly. As a result, the press of humanity has become Cairo's most ubiquitous problem. Its symptoms hit the visitor in the face. Sidewalks are virtually impassable: parked cars, broken pavement, vendors, and construction materials make them into obstacle courses. The terrible crush of people usually makes it easier to walk in the street, which is where more pedestrians end up. Car traffic holds its own terrors, of course, and not just for pedestrians. Private vehicle ownership multiplied during the 1970s due to a lowering of import fees, but Cairo lacked the facilities to accommodate all the new cars. Cars were therefore parked wherever it was convenient, trucks made deliveries from across the street, donkey and bicycle carts slowed down traffic on the few large streets, and the result was a daily flirtation with total gridlock. From his first days in office, Husni Mubarak devoted considerable attention to these problems of transportation, and improvements in this domain stand out as a principal achievement of his regime. Overpasses arise at busy intersections, elevated highways extend for miles, construction of the subway system goes on around the clock, and police ensure the free flow of traffic by handing out stiff fines. Problems remain, however. The overpasses scar the city and merely transfer traffic jams upward. Poorly refined gasoline gives off fumes that make streets unpleasant and occasionally induce illness. Parked cars will continue to obstruct all forms of transportation until multi-story garages go up in the city center. The quality of life will continue to decline until the entire infrastructure of Cairo is overhauled - including sewers, electricity and telephone lines, major arteries, and public transportation. Cairo has enormous importance in the political life of Egypt: not only is it home to almost a third of the country's population, but it is the only place where actions by citizens can shake the government. Thus, the mundane problems of Cairene life, if not dealt with, may pose a greater threat to Mubarak than the grander issues such as democracy and peace.